Ardor is a Western in spirit, but with a serious lack of tension, it's far less notable than some of its obvious influences. Ardor may be an Argentinian thriller about wretched land-grabbers, but it’s hard to ignore the heavy “gunslinging West” influences scattered throughout filmmaker Pablo Fendrik’s eco-political PSA. Its structure is built on one single event, as Fendrik stretches out a family’s homeland defense story into an entire feature film (running at a questionable hour and forty minutes). Men are slain, shootouts are had, and blood is spilled in the name of property, but the film’s anti-stealing message is lost somewhere in a rogue warrior’s attempt to ward off menacing jungle criminals (in a less-efficient-Rambo kind of way). I’m sure that land-poaching is a huge problem in lawless thickets of foliage, but this is more about a slow-burn spectacle than it is environmental causes. Gael García Bernal plays Kaí, a stranger who shows up at Vania’s (Alice Braga) residence shortly before a group of thugs strong-arm her father into signing their land away – right before they kill him. They steal Vania afterwards, taking the woman for their own use, but Kaí quickly sets her free after successfully hiding from the jungle thugs. The group’s leader, Tarquinho (Claudio Tolcachir), doesn’t take kindly to the attack, but it isn’t until Kaí steals back the signed document that Tarquinho retaliates. Kaí and Vania have nothing to lose, so they invite Tarquinho’s men to attack the land they tried to bully their way into owning, as a heroic last stand. They might be outnumbered, but they have the jungle on their side – unfortunately, that might not matter in the end. The film starts by explaining native folklore, detailing how inhabitants of the Paraná jungle used to invoke beings of the river’s current to protect against any invasion. It was their cry for help towards Mother Nature, when man’s greed turned to deforestation and the destruction of luscious landscapes. This begins Ardor with a very native mysticism, where a fantastical bit of wonder suggests that we may experience a spiritually enhanced watch that balances modern issues with indigenous tall tales. Sounds exciting, right? Well, don’t get your hopes up. Fendrik’s story is extremely by-the-books, and remains solely in a realm of human cinematics. 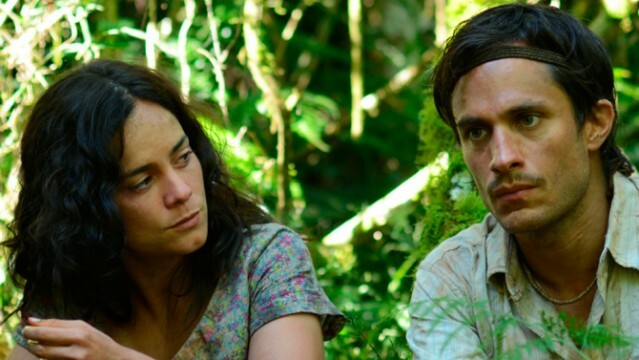 Gael García Bernal’s performance as a steamy bit of rebellious man-meat comes across with flooding amounts of nature-loving paternal instincts, but the film itself is extremely dry. The crime on hand may be atrocious, but Kaí’s violent fight for property doesn’t carry the societal weight Pablo Fendrik hopes for. In keeping comparisons to Sergio Leone-directed spaghetti westerns and whatnot, Ardor feels eerily reminiscent to this year’s Slow West, only without the buildup and redemption. Slow West grasps onto slow-burn tension with a steady reign, yet Ardor lets the tension slack with a more lax hold – for example, Kaí’s unnecessary jungle quickie that’s meant to establish some sort of (meaningless) romantic connection. There’s a strange force at play because while Ardor is about protecting our most basic rights, it never feels terribly genuine. Fendrik is all about transporting his viewers into the serene, dewy mists of a beautiful Argentinian jungle, and he does so through glistening tracking shots of snake-like river connections, but all the physical beauty is outweighed by a story that’s far too simple for its own good. Ardor stumbles because it becomes the film we expect far earlier than we’d like. Sure, there’s not much else for Kaí to do given he has zero technological advances, primitive weaponry, and nature’s harsh surroundings to worry about, but Fendrik struggles to breath life into Tarquinho’s attacks. There are SO many opportunities for this movie to end, yet no character wants to step up and bring on the credits. Decisions seem to be made solely to delay the inevitable. Marksmen show the inept shooting capabilities of Stormtroopers whenever Kaí runs to escape, strategists draw blanks in the face of favorable odds, and it seems like there’s an overseer protecting Fendrik’s heroes with every step they take. Maybe those are the current spirits ensuring that evil is punished for their actions? Or just easy plot manipulation on the part of an overly elongated screenplay. Despite Gael García Bernal’s shirtless patriotism, like he’s ripping the oppression right off of his back (for the ladies), Fendrik has a soulless misfire on his hands. Alice Braga is nothing but a sexual pawn, Claudio Tolcachir is an inept villain, and Ardor unfortunately exists as a mystical dud that’s far too narrow-sighted for its own good. Where are the current Gods when you need them?